This post is for Captivate versions before 9. 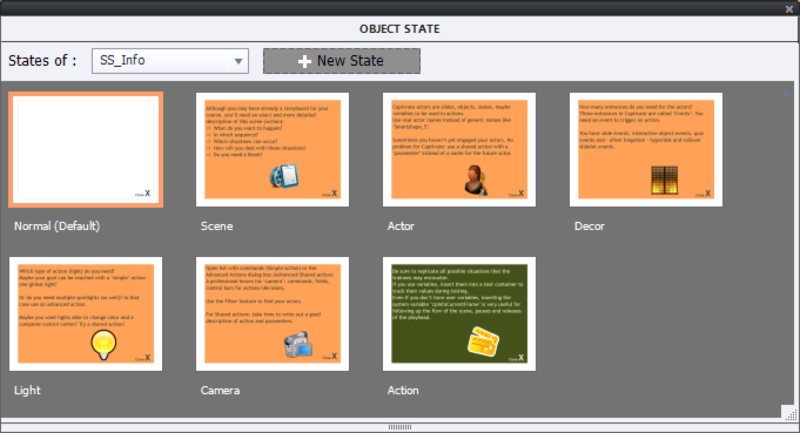 In version 9 real knowledge slides are introduced. 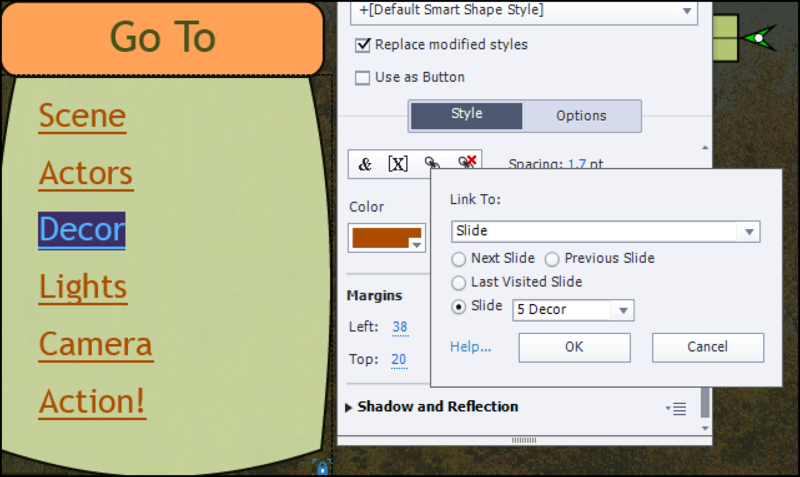 In this post the workaround to use normal question slides as knowledge check slides is treated. Not a shared actions post this time (still busy with the third post), but a quick tip describing a work flow that I already posted multiple times on the Captivate forums. It is an answer to this question: "How can I reset a question slide immediately, if it is a pure knowledge check, no scoring". 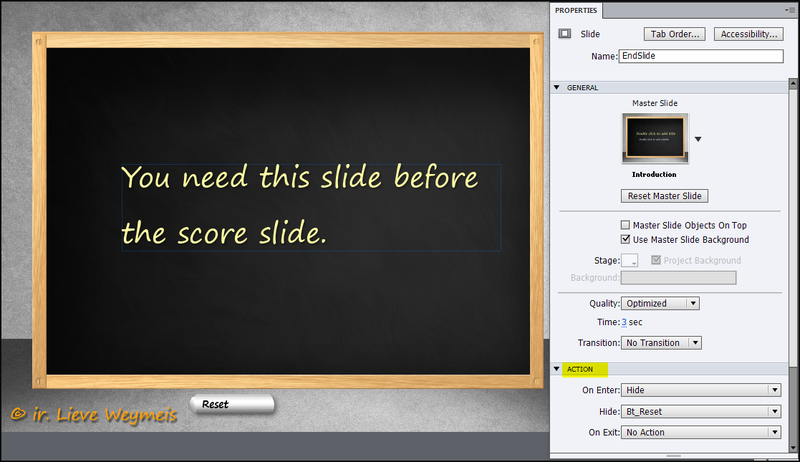 For knowledge slides, where scores don't have to be saved, you will not want to insert a score slide. But if you can cope with the fact that all answers will be cleared also for other knowledge slides in the file, you can create a 'Reset' button for a slide, without having to show the Score slide. 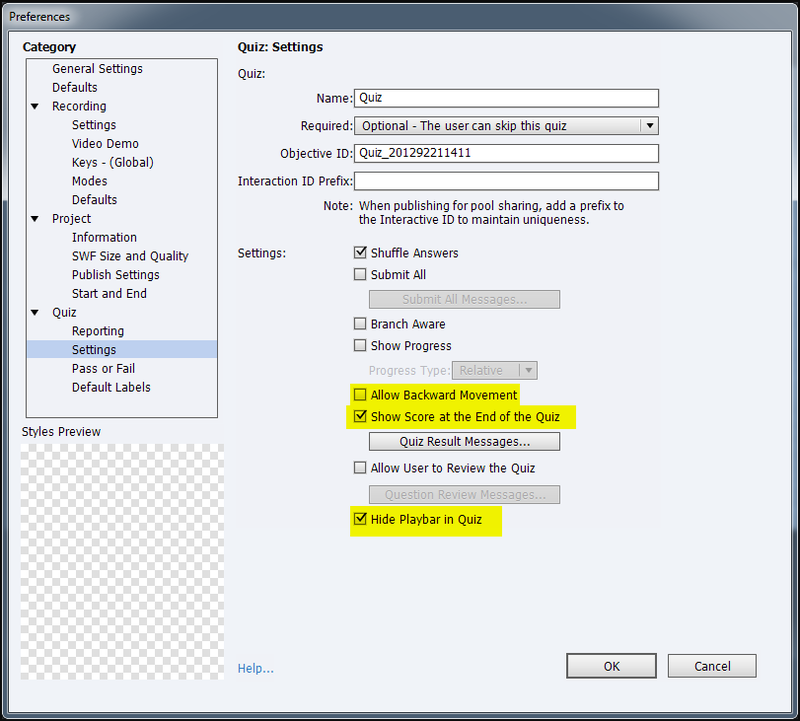 The Retake button will appear on the score slide if the attempts on quiz level are not exhausted. The attempts are tracked with a system variable cpQuizInfoAttempts. That variable is incremented when a new attempt is started. The idea for the Reset action is simple: navigate the user to the score slide, and immediately back to the slide where he was answer in knowledge question. And that slide will be reset! Watch this movie, to see the functionality of the Reset button. On each question slide you can use the two-step Submit work flow. Nothing will happen, you'll be able to Reset the answers as many times as you want. You need to click the Next button to go to the next Question. Edit the Quiz Preferences, set the number of Attempts to Infinite (or to a high number), it is not really necessary to show the Retake button. Be sure to hide the playbar, to check 'Show Score slide...' although you'll never show that score slide to the user, you need it. Do not allow Backward Movement. Check the two images below. With the setup used in the example, you'll need to have the Next button visible. Do not drag it under the Clear button as I often advice to avoid confusion with the Submit button. You can use any type of questions, with one exception: Hotspot. Problem with Hotspot is that when the user clicks on the Reset button, it will be considered as a click on a hotspot (and the animation will appear). You see in the example that I even used partial scoring for some MCQ-multiple answer questions. The setup for the question slides: I kept the attempts to 1, but changed the actions both for Success and for Failure to 'No Action', hence the need for a Next button. 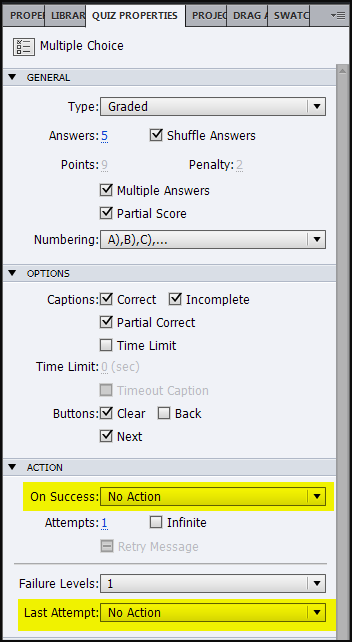 If you want, you can keep the 'Go to Next Slide' as Success Action, but if you have have partial scored slides, you have to know that partial correct answers will trigger the Success action, which means that the user will not be able to reset and correct his answer. Create a shape button as Reset button. In the example movie I used one of the images from the theme as Fill for a rectangle shape with no stroke, to have a look that is similar to the embedded quiz buttons. 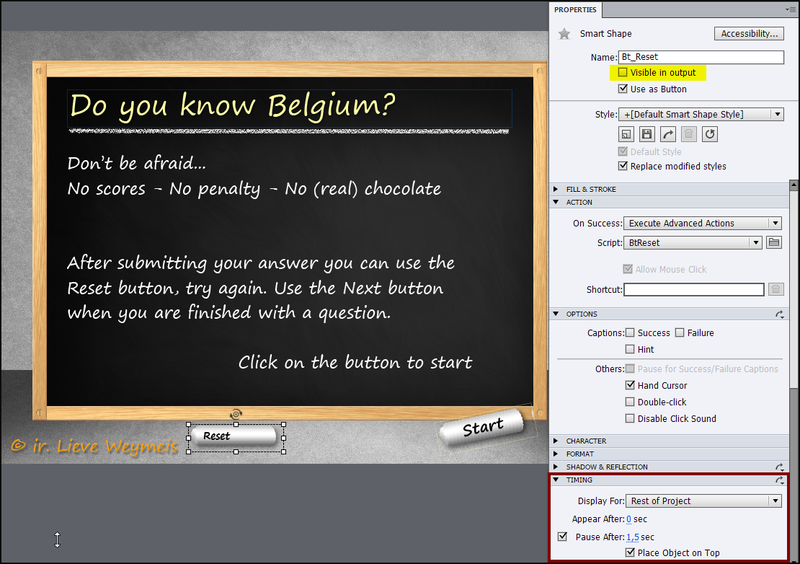 To have this button on all the question slides, you can either put it on the Quiz Master slides, or put it on the slide before the first question slide, make it invisible (Properties panel), time it for the rest of the project. I choose for the second work flow, because the shape button gets an ID, can be shown/hidden as wanted. It is not possible to put it on the first question slide, but I made it visible with the On Enter action of the first question slide. More information about buttons on question slide is to be found in a previous blog post: http://blog.lilybiri.com/want-a-button-on-question-slide-in-captivate. To avoid the user seeing the score slide, you'll need at least one slide before the score slide, and prevent navigation to the last slide. In this case I added one slide, that has no navigation button. 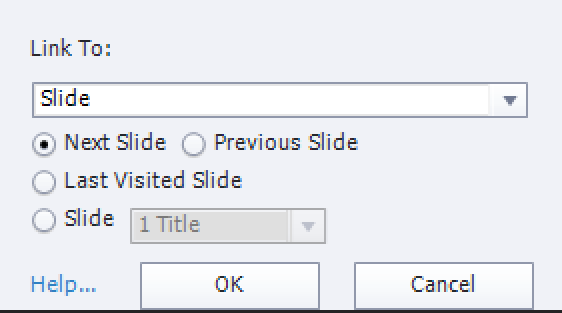 Because the Reset button is still visible, I use the On Enter action of this slide to hide it. 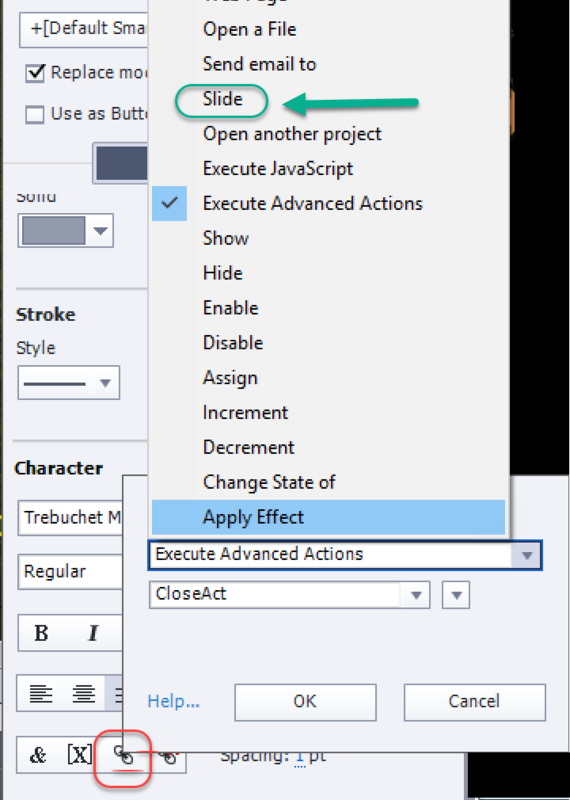 If you plan to use this action in multiple files, create a shared instead of an advanced action. It is easier to reuse a shared action because it is in the library which you can use as an external library. This type of knowledge questions will probably be between content slides. You have to be aware that all answers are reset with each Reset button on one question slide. Maybe better warn the user if you allow free navigation with a playbar, a TOC or custom buttons.